Well, I leave in the morning for a week in San Diego with my daughter and then a week in San Francisco at the EGA National Seminar. While at Seminar I will be taking Vima deMarchi Micheli's course on Italian needlework and attending her lecture as well as helping out her Italian guests with market day and anything else they need. Giovanna from TuttoRicamo is coming and Clara from Giuditta Brozzetti as well as Tiziana and Anna Maria from the Accademia Punto Assisi too – I can't wait to see everyone! I didn't get all the posts finished that I wanted to and I'm not sure how much (if at all) I'll be able to post while I'm away. I certainly won't have access to my library or a scanner. Please use this time to go back and check out some older posts. My statistics program tells me that on average each visitor only reads about three posts - there is so much more to see and I only started in March of this year so it won't be an endless task. 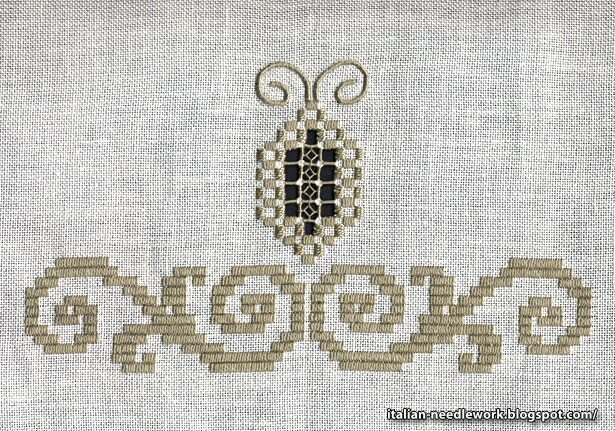 I do have so many more things to tell you about so I hope you will come back and visit my blog after September 14th and we'll resume our journey through Italian needlework! I'm leaving on vacation on Friday and finding it very difficult to get everything done before I go. Please forgive me if I just give you a series of links to explore! This is Elena of Italian Needlecrafts' blog, she weaves and likes textile history too! This is another Elisabetta's blog - her stitching is exquisite! 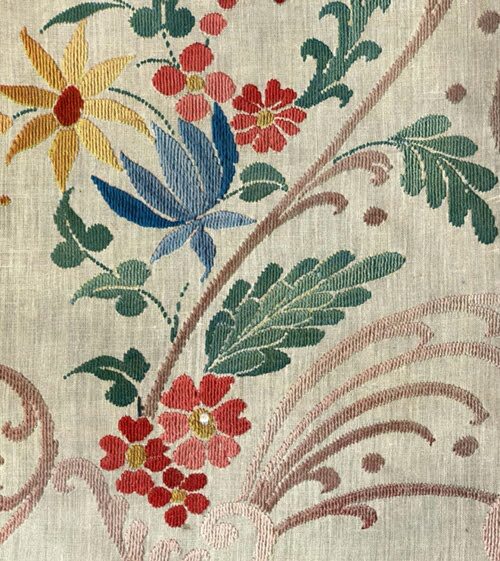 Stella's website on Palestrina Embroidery - get something to drink and enjoy! Sorry, I'm still too new to blogging to figure out how to make these links "clickable" - copy and paste them into your web browser. 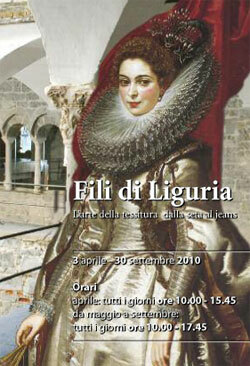 This exhibition is going on right now until September 30, 2010 at the Abbey of San Fruttuoso a little to the south of Genoa on the north-western coast of Italy. Liguria is well-known throughout history for it's textiles, macramé and bobbin lace and there is plenty of all that at this little show. Two dresses from paintings of Genoese nobilewomen have also been recreated in exacting detail. The gown from this portrait by Rubens of the Marchesa Brigida Doria Spinola (1606) and the gown from this portrait by Van Dyck of Caterina Balbi Durazzo (1624). On YouTube there is a six-minute video of a television report on the exhibition. It is particularly interesting as they show some great details of the gowns. There are also some beautiful fabrics and macramé fringes as well as laces and gold embroideries. Worth a look! Sometimes you come across an embroidery that is so amazing that you can look at it forever – or never tire of looking at it. I'm so sorry that the detailed close-ups didn't turn out but do take a close look at all the things going on in this work; the hair, clothing, different fillings, padding – just each and every thing really. It was embroidered by the young students of the Don Mazza school in Verona somewhere around the turn of the 20th century. It's here! It's here! I can finally talk to you about the latest book that I helped with! Late this past spring Anna contacted me and asked if I would do her the favour of correcting her English on a book she was writing. Of course I agreed! 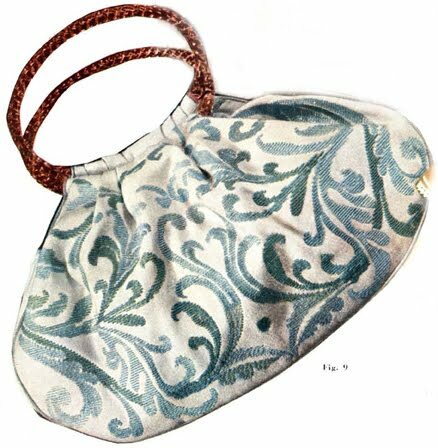 I have had the great fortune to see Anna's needlework many times in the Italian needlework magazines RAKAM and Ricamo Italiano and also at her house in Verona. Anna likes to fill voided spaces in her embroidery with needle laces stitches from techniques like Hedebo, Reticello, Teneriffe, Aemilia Ars and other needle lace techniques. This book is filled with a great many step-by-step instructional photos and Anna includes little tips and tricks for achieving better results along the way. There are four different projects, each with a variety of different filling stitches all explained in great detail. 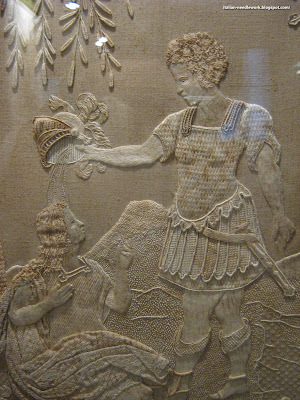 Included also are photos of some of Anna's embroideries executed in this technique. There is something here for everyone, from elegant designs to cute ones like the Tortoise on the cover. Text is in both Italian and English. You can read more about Anna and her needlework activities here and here. For an extensive book review, go here. The book is available from Elena at Italian Needlecrafts. 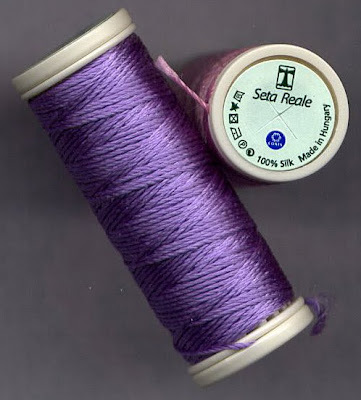 I was reading Mary Corbet's Needle n Thread blog about different types of threads which led me to remember that I was going to tell you about some different Italian threads but in the meantime I've been discussing needle lace making with coloured threads with Silvia of Dentelles d'abord. I see she's posted her lovely needle lace brooch done in coloured thread with a great how-to series of pictures so even if you don't understand Italian, you should be able figure out how you can make her covered buttons. 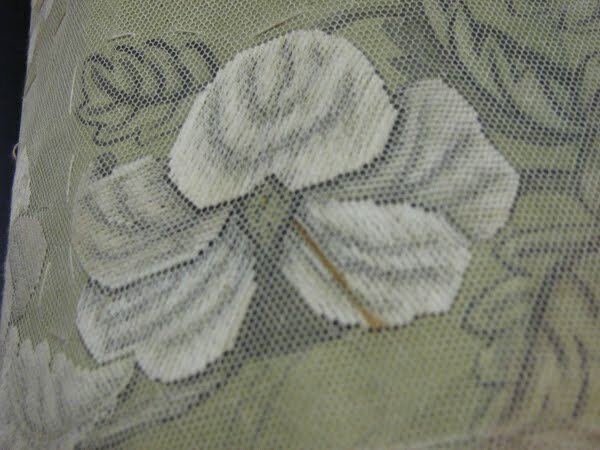 While you're there, you should check out the rest of her blog, she's got some lovely pictures of needle laces. Anyway... I wanted to tell you about Seta Reale by Coats Cucirini which does not seem to be part of the North American lineup of threads. I got mine from Italy though a Google search turns it up on the Coats UK website. (My spools came from Italy but were made in Hungary). 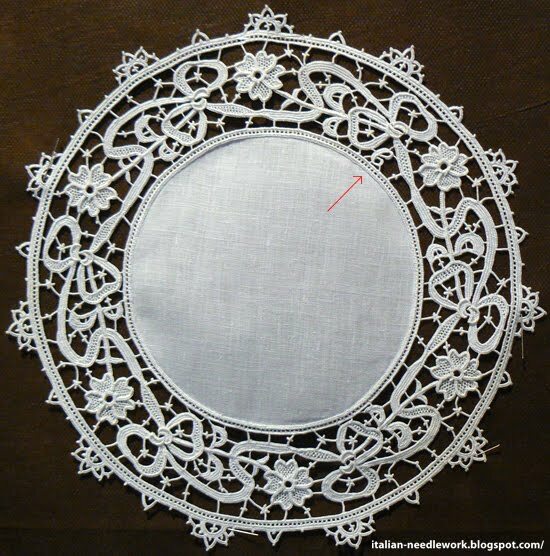 I think maybe Silvia made her Sun needle lace piece with this thread but I haven't remembered to ask her... perhaps she'll comment here below. If I understand correctly, this thread comes in two weights: 30 (which is the kind I have) and 100 which is extra fine. Available in 128 and 59 colours respectively means you can have all kind of fun! The UK website has a downloadable colour shade card. If you've ever seen any of Lucia Costantini's laces, you'll know that coloured lace can be just as breathtaking as white lace. I tried some pulled stitches and satin stitches (as I am no lacemaker!) with it and it glides through the fabric so smoothly and its so shiny! ...I'd also like to try the finer weight... I'd like to have all the colours... Oh, I'm in trouble now! I know Italian Needlecrafts has some of the 30 weight but I see that Elena hasn't had the time to put them up yet on her website, send her an email if you want to try some and let me know what you think! Broccatello fabric is very much like Brocade fabric but a little lighter. Large patterns are woven in such a way as to be raised from the background. It can be used in religious vestments or overclothing like jackets and is more commonly today used in furnishings and upholstery. 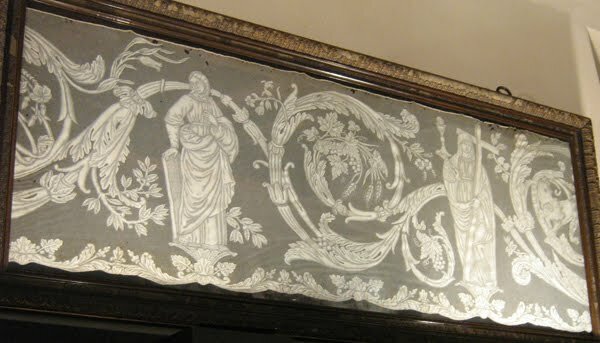 The centre strip of a 15th-16th century Tuscan chasuable here gives you little bit of an idea of what I mean (click on the picture for a little larger photo). There are also some photos here of Broccatello fabric which is still made today at Ars Regia in Ferrara. Two beautiful Broccatellos woven in Venice at Luigi Bevilacqua can be found by clicking on the word "Catalogue", then "Broccatelles". The best close up I could find is here at the Antico Setificio Fiorentino in Florence. 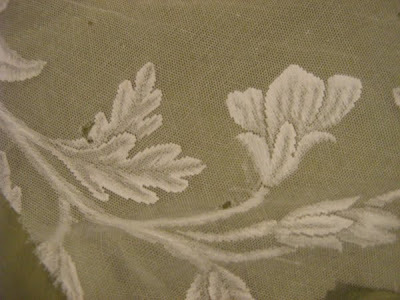 Punto Broccatello or Bokara Couching is a form of Italian needlework which imitates the effect of Broccatello fabric. In the central rose window design here, you can get an idea of the effect Punto Broccatello imitates, though that photo is of a woven piece. While Bokhara Couching has origins in the Orient, it is probable that it came to Italy through Sicily with traders from the East or Morocco. Nuova Enciclopedia dei Lavori Femminili by Mani di Fata describes Punto Broccatello as being suited for fabrics such as Organdis and Linen but also for heavy fabrics. 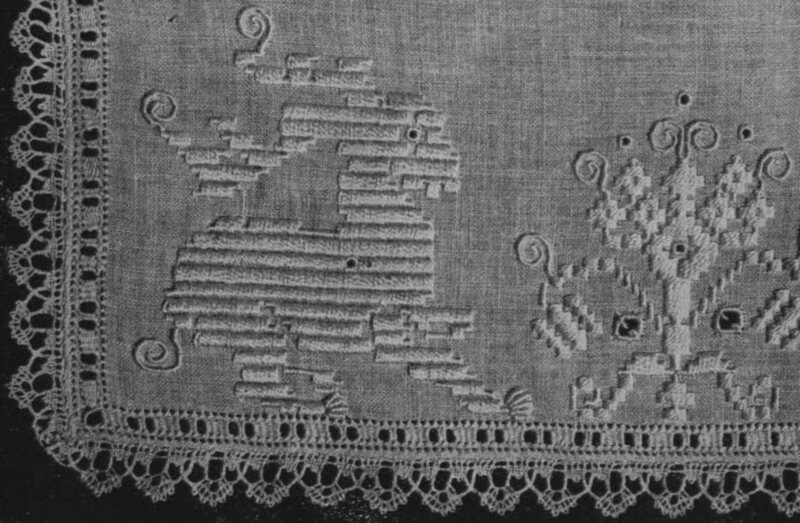 The stitch can be executed either in horizontal or vertical lines and is a self-couching stitch with the couching stitches slightly diagonal. The Manuale del Cucito e del Ricamo by Cucirini Cantoni Coats says not to follow the outlines of the design but to fill spaces with rows on the straight of the grain with a distance of two or three ground threads between rows, depending on the density of the weave. I have two Mani di Fata pattern books for Punto Broccatello. One is just iron-on transfers which indicate where you should place your lines of stitches and the other one is from the 1950s with some photos of stitched pieces as well as traceable designs. I really like it executed on coloured fabric with white thread as shown here. While in Italy last year I saw a lovely pastel green tea service tablecloth from the 1950s which this reminds me of. 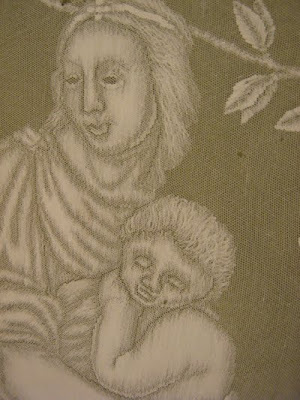 You should be able to get Mani di Fata Broccatello iron-on transfers from Italian Needlecrafts, though you may have to ask Elena if she can still get them, I didn't see any on the Mani di Fata website – I only got my iron-on pattern book (Disegni Decalcabili - Motivi a P. Broccatello no. 159) a couple of years ago but it could have gone out of print. I believe my copy came from one of the Canetta stores in Milan. I give you the entire article in Italian for those Italian readers and I will translate it here below for those English-speaking readers. "Dress designed from a sketch by A. Rubbiani by A. Casanova and executed by commission for Signora Marsaglia Balduino (Genoa) in 1905, according to the fashion of the time. There were 15 different kinds of birds among flowers, fruits and ornaments. The hemline was made of individually attached peacock feathers so as to be light and rich at the same time." 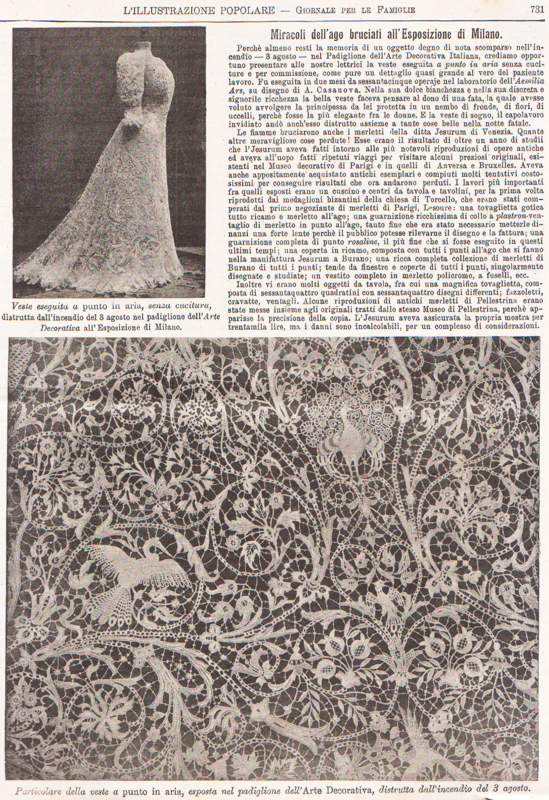 Because at least the memory remains of an object worthy of note lost in the fire – August 3rd – in the Italian Decorative Arts Pavilion, we believe it opportune to present to our readers the gown executed in punto in aria without seams and made on commission, as an almost actual-size detail of the patient work. It was made in two months by sixty-five workers at the Aemilia Ars workshop from a design by A. Casanova. In its sweet whiteness and in its fair and refined richness the beautiful gown made one think of a gift from a fairy who had wanted to wrap up and protect a princess in a cloud of leaves, flowers, birds because she was the most elegant of women. And this dreamy gown, an envied masterpiece was itself destroyed along with many other beautiful things that fateful night. The flames also burned the laces of the company Jesurum of Venice. So many other wonderful things lost! 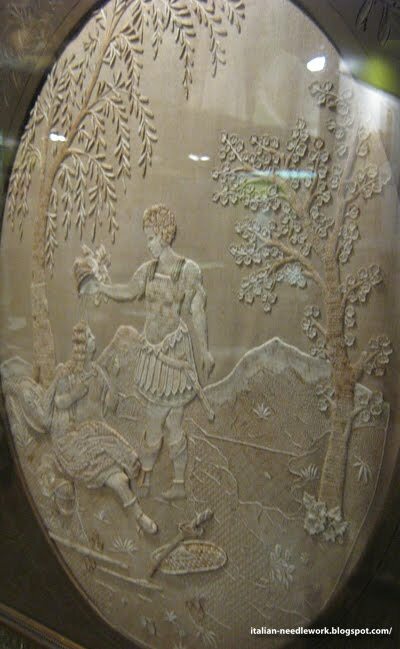 They were the results of more than a year of study done by Jesurum of the most remarkable reproductions of ancient works and for that purpose many repeated trips were made to visit a few precious originals kept in the Decorative [Arts] Museums of Paris, Antwerp and Brussels. They had also specially bought ancient fragments and made many very expensive attempts to achieve results which are now lost. Among the most important works displayed were a cushion, table centres and doilies, reproduced for the first time from the Byzantine medallions of the church of Torcello, which were bought by the best lace dealer in Paris, Lescure: a Gothic placemat all embroidery and needle lace, a trim rich in a plastron collar [sorry, I don't know what this is!] 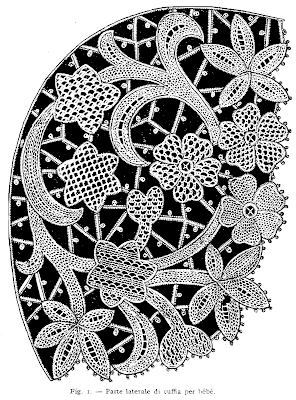 fan of needlepoint lace, so fine that it was necessary to put a strong lens in front of them so that the public might see the design and workmanship; a complete trim of Rosaline Point, the finest that has been made in recent times; an embroidered blanket, made with all the needle lace stitches manufactured by Jesurum in Burano; a complete rich collection of Burano laces of every stitch; window curtains and covers in every stitch, individually designed and studied; an outfit in coloured lace, bobbin lace, etc. There were also many items for the table, including a magnificent placemat, composed of sixty-four squares with sixty-four different designs, handkerchiefs, ties, fans. 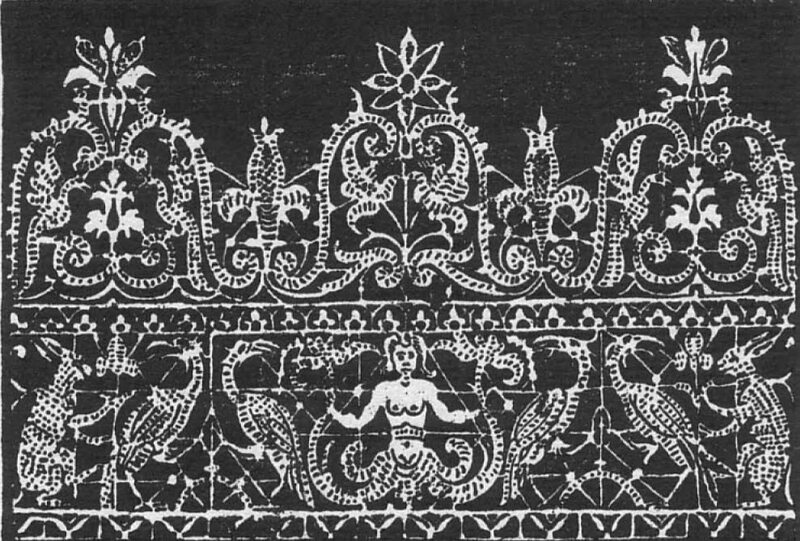 A few reproductions of antique Pellestrina lace were placed together with original pieces from the same Pellestrina museum to show the accuracy of the copy. Jesurum had insured its exhibit for thirty thousand lire, but the damages are, in a complexity of respects, incalculable. 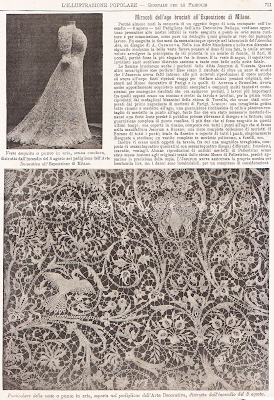 Photo of dress: Gown executed in punto in aria, without seams, destroyed in the fire at the Decorative Arts Pavilion on the 3rd of August at the Exposition in Milan. Photo of dress detail: Detail of the gown in punto in aria, exhibited in the Decorative Arts Pavilion, destroyed by the fire of the 3rd of August. If anyone can tell me about the plastron collar fan - I'd appreciate it! Many thanks to Claudio for this article! There is nothing like coming home from a difficult day at work to find a manilla envelope from Italy sitting in the mailbox. It doesn't matter what's inside, as soon as I see that golden paper sticking out of the top of the mailbox, I know my day is about to get infinitely better. It is the latest book by Antoinetta Monzo Menossi, collaborating with Laura Marzorati and Stefania Bressan. Three enormously talented needlewomen who have worked together to bring us lace-like drawn thread work. While the text is in Italian only, the diagrams and step-by-step photos are so good, you can figure out the compositions easily. The book is 64 pages and goes for 18 euros. 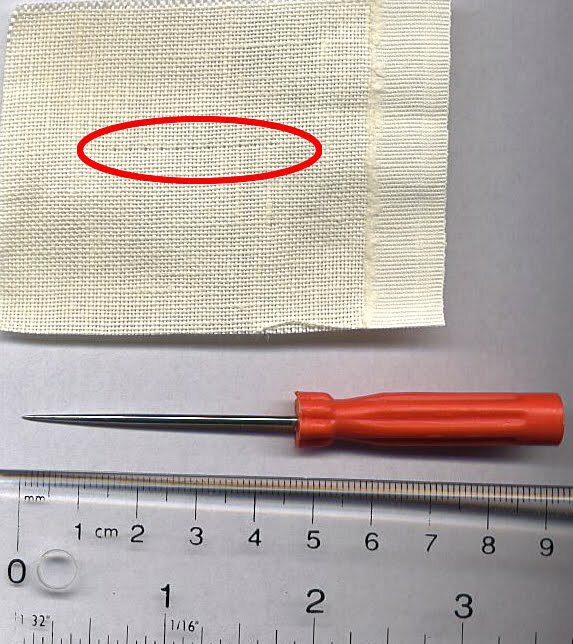 There are over 30 stitches explained and many corner treatments as well as tips and tricks. 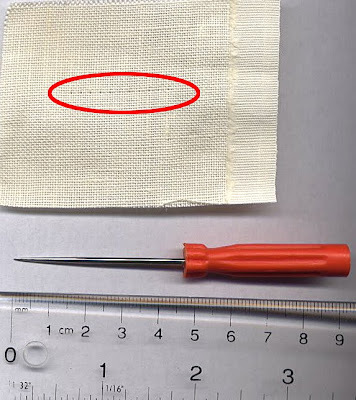 All stitches are accompanied with actual photos of what they look like stitched up. 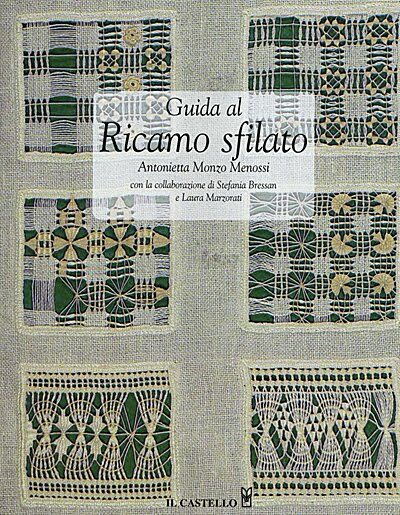 You can purchase Guida al Ricamo Sfilato from Tombolo Disegni, click on "Libri/Books", then "Libri/Ricamo", then "Ricamo Italiani" – send an email request to order. I notice today that there is also a new book on that page on Punto Perugino which we talked about yesterday! Recently the School-Workshop Punti d'Arte in Città della Pieve, near Perugia, Italy has done some extensive research into this technique. In talking with a Sister of the local Convent of the Poor Clares, some of the history of Perugian Embroidery was discovered and a few ancient examples preserved by the sisters, were viewed. 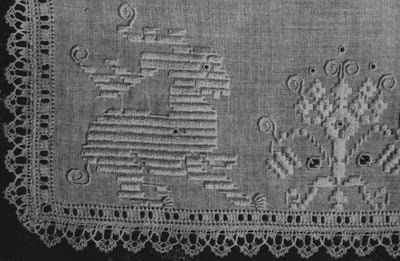 At least as old as the end of the 18th century, motifs such as stylized animals and fantasy creatures, flowers and volutes, figures and geometrical patterns are worked in Satin Stitches on robust evenweave fabric in single colours such as rust, light brown, red, blue or the particularly characteristic saffron yellow, obtained from crocus flowers grown in the area, fibres are dyed using ancient local recipes. Perugian Embroidery is a Counted Thread technique and one must decide first how many Satin Stitches to execute for each square of a design, ie. 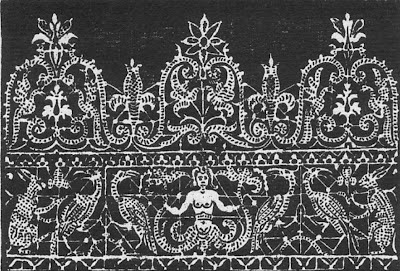 the graphed patterns resemble those prepared in Cross Stitch or Filet Lace and then each square is represented by a group of 4, 5 or 6 Satin Stitches. 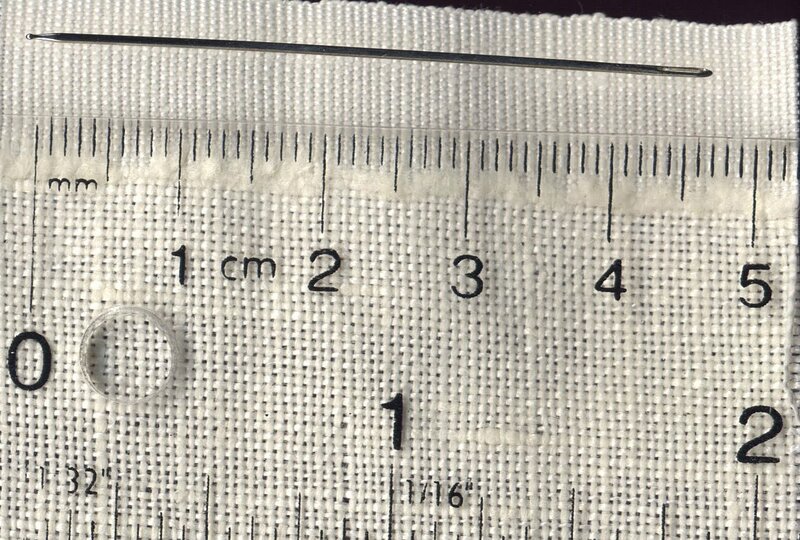 The Satin Stitches can go over 3, 4 or 5 ground threads. There are also accompanying openwork areas such as Cutwork and Eyelets as well as Bullion Knots and Curl Stitches. Image from Manuale del Cucito e del Ricamo, Cucirini, Cantoni, Coats, II Edition undated. 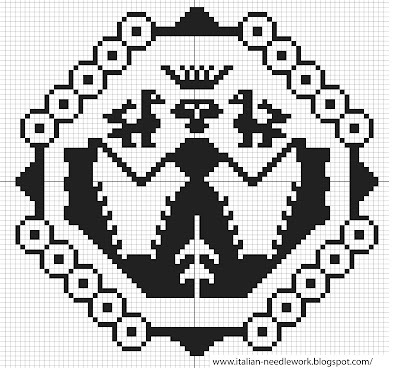 There are some free pattern downloads from the Italian needlework magazine Ricamo Italiano here and here. 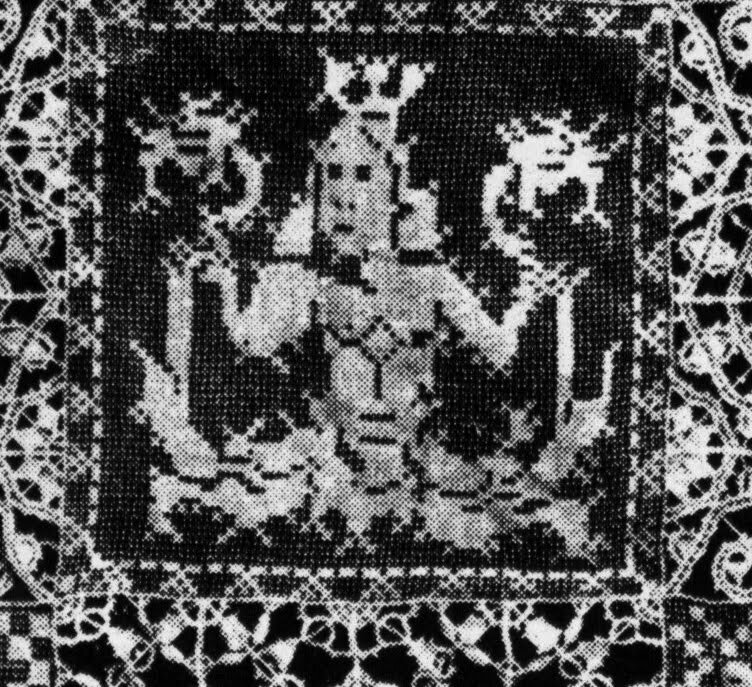 Besides monsters, I love finding Mermaids and/or Sirens in embroidery and lace. I can't tell you why and you could even say that the Siren is a type of sea monster. They are always wicked in the old tales and it was probably not until Hans Christian Andersen that there was a sympathetic tale of these creatures - don't quote me, I'm not up on my Mermaid/Siren history. The Greeks didn't even associate them with the sea but the Romans did and since we're talking about Italy, let's go with the Romans! You do need to know however that Sirens get some bird-like history from the Greeks so sometimes they are depicted with wings. Enough background – on to the Sirens in needlework! Years ago when searching for Italian patterns, I came across the Coraggio Sampler by The Scarlet Letter. This sampler has all kinds of things I like including monsters and a Mermaid. 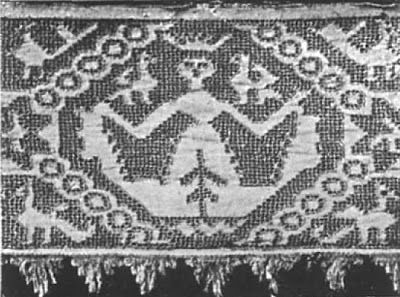 I actually came across a sampler in an Italian museum with the Mermaid from this sampler on it but I didn't note it down and now I'd love to know where I saw it!! Anyone know? Please leave me a comment below! 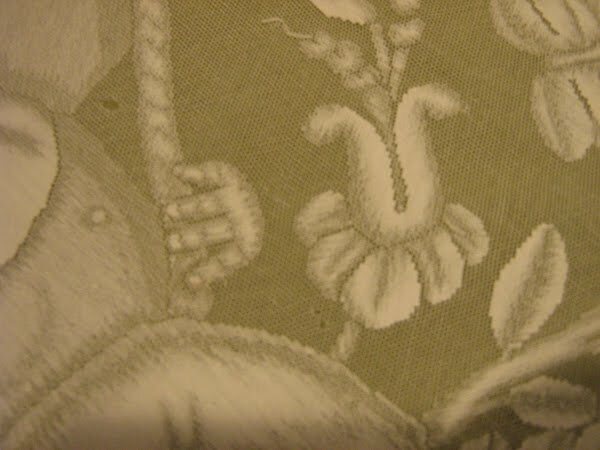 I like the documentation that goes with the Coraggio Sampler, it has references to 16th century antique pattern books. I ordered it with all the silk threads and then decided to modify it with other antique Italian motifs I liked so it sits on the floor stand in my living room and once in awhile I sit and put in a few stitches on it. I'm afraid it has been sitting there for years. I took a crack a charting the design, what do you think? She's pretty scary! You can download some of Elisa Ricci's books and some antique pattern books from the Online Digital Archive of Documents, or you can purchase a collection of 5 antique pattern books together in one volume from Italian Needlecrafts. Whenever I think of Embroidery on Tulle, I always think of light, gauzy flowers on a veil or hemline like the one pictured here. 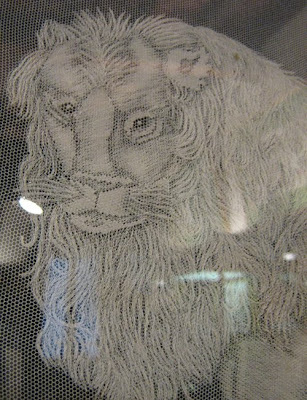 While in Verona last year however, I discovered the art that is embroidering pictures on Tulle in Italy, using different densities of thread to provide shading effects. 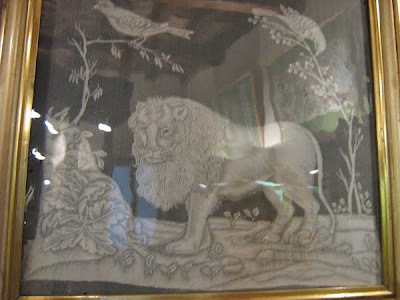 In the Don Mazza Museum in Verona, there are several amazing examples of this delicate art. I'm sorry that most of my photos are blurry but you get the overall effect. This piece was framed and rightly so! In the book that I picked up about the vestments made by the embroiderers at the Don Mazza School there is a picture of a gown of Don Mazza's which has the Virtues depicted along the cuffs and around the hem (front and back!) in this type of needlework. This is a fragment of the same style of design which was on the gown, though the subject matter is different. The women of the Cultural Association "I merletti di Antonilla Cantelli" have launched their website! 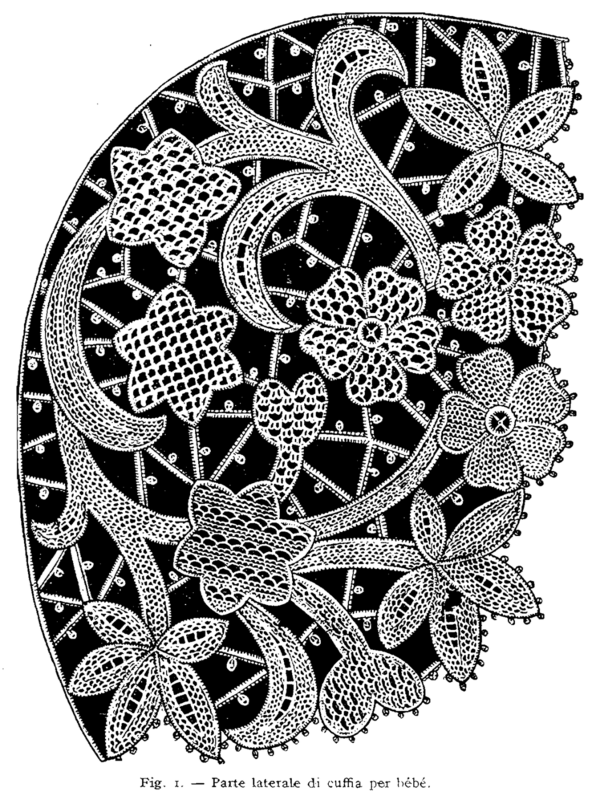 This group of women studied under the Aemilia Ars needle lace master Antonilla Cantelli and formed their association in 2004 in honour of their master and to promote the continuation of this exquisite form of needle lace by teaching the methods and criteria which they, themselves were taught. The website is in it's infancy so bookmark it and check back often or sign up for their newsletter even if you don't speak Italian, notices will prompt you to check out the website. For now the site is in Italian only. Plans are to post the history of the society which started it all, biographies of the protagonists connected over the span of more than 100 years, stories, documents and photos; then also the work of the Cultural Association and it's shows, exhibitions, classes and more! Please remember that building a website takes time, as does collecting and organizing material and that the women will be dedicating their spare time to updates. Right now they are tweaking and trouble-shooting the site and appreciate any feedback you may have. Go ahead and email them in your native tongue, they will find a way or the people to translate. 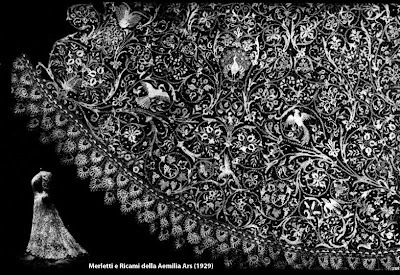 To see more laces and designs by Antonilla Cantelli, check out the book by her grand-daughter, Barbara Cantelli: L'Aemilia Ars di Antonilla Cantelli. Many thanks to Elisabetta for the use of her beautiful photos! I want to share three of my favourite needlework gadgets with you. They may not necessarily be Italian, but I got them all and learned of them all in Italy so this is how they tie in with my blog. This awl is about 3 5/8" long, the handle is plastic and the metal shaft is a bit rough, that is, it's not perfectly smooth, its got a few burrs - so I wouldn't go near any silk with it. 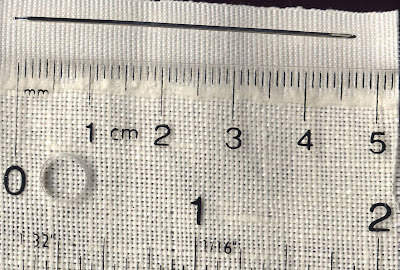 I was advised to use it to count ground threads on high count fabric (38ct shown above) when doing hems or other drawn thread areas. Count over 10 (or however many you like) ground threads and push the awl into the fabric between the ground threads. You are left with a little hole which stays visible for quite awhile. This is extremely handy when calculating or counting out Four-Sided Stitch-based hems or any other counting really. I think the roughness of the shaft of the awl helps in keeping the hole visible by roughing up the threads just a bit so that they don't fall back immediately into place. Once you do your stitching, washing and ironing, there is no trace of the holes. My ball-point needle is about 1 7/8" long and is used for withdrawing threads. (Click on the photo for a close up look) They come in varying lengths and also with wooden handles. It is the best thing ever! 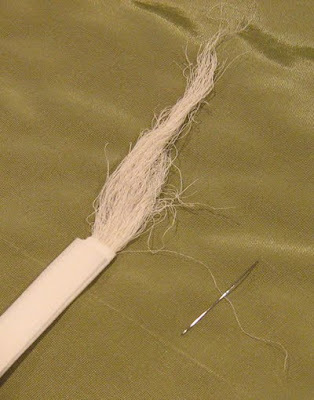 I used to use a regular #24 tapestry needle for withdrawing threads but sometimes I'd have to slide the needle under the thread 5 or 6 times before pulling up at the right moment to pull it out as the thread would slide off the end of my needle. Now with the ball-point needle, the thread doesn't slide off the end and I'm able to go much faster when withdrawing my threads. The length of this ball-point needle makes it very easy to hang onto. It has revolutionized the way I prepare my drawn thread work channels! 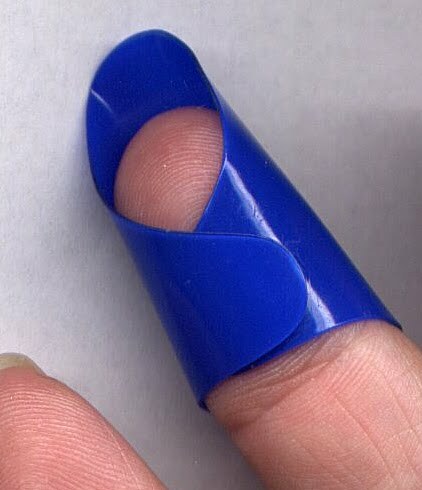 It wraps around your finger so it will fit any size. 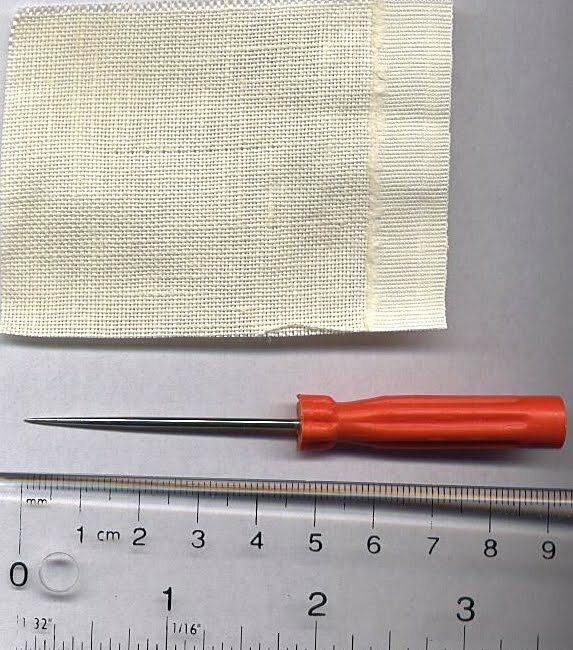 Placing the shielded finger under your work means that you can stitch "scoop-method" without stabbing yourself when using a sharp-tipped needle. It took a bit of getting used to but now I don't hemstitch without it, whether I'm using a tapestry or sharp needle. The Salvadito makes the going so much faster as the needle just glances off the plastic below - no stabbing, no catching. Where to get these gadgets? Well, I bought the Salvadito at the Italia Invita Forum in 2007 but I see they are at Lacis in California, under Thimbles. The long-shafted, ball-point needle – which I understand are hand-made, I ordered from Tombolo Disegni. Click on "Negozio/Shop", then "Aghi", scroll down to the third row, they are the "ago/aghi con la punta a pallina". Send an email request to order. For the little awl, I don't know what to tell you. It was a gift to me from a lady in Ferrara who bought it at her local Merceria which is like a haberdashery or notions store. There is no manufacturer's name on the one I have. I have tried using regular awls but they are too smoothly finished and do not leave the holes for long in the fabric like this one does. If you know where to get them online, will you leave a comment below? Venetian needle lace is, without a doubt, absolutely gorgeous. On my honeymoon many, many years ago we visited a small lace company in Venice. I was fascinated watching an elderly woman making Venetian needle lace on a pillow in her lap while the owner of the shop explained how the lace was made. She told us how different women specialized in different stitches so that the work was passed around and each woman filled in a different area in her perfected stitch. She told us of the hard life of the lacemakers of the past who worked by sunlight or candlelight and who went blind. I stayed behind while the others moved on with the owner so that I could watch the lacemaker continue to work her piece. She smiled at me and motioned me to come closer. Silently she showed me the stitch she was doing - she worked so fast! 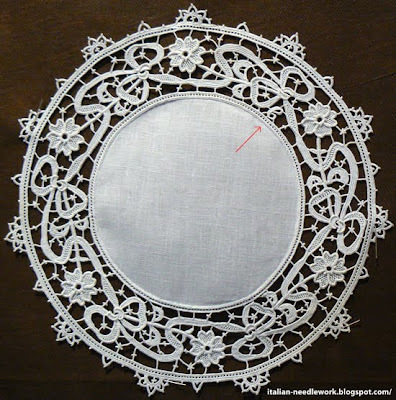 I had only very basic Italian in those days but with sign language we did quite well, she slowed down to go step-by-step to show me how she skipped a stitch here and there to form "holes" in the lace which formed a pattern. I was fascinated watching her work for some time. Only when my husband appeared in the doorway looking for me did I realize that I should be going. The lacemaker put her hand over mine and squeezed it. Then she gave me a kleenex tissue. Of course tears were running down my face and I hadn't noticed. I'll always think about that lady. I've been back to Venice many times but I could never figure out where we had been. I have a few friends who are either expecting a baby or have just had one. I always love the lavish baby things that Italians make and so I got lost among my books and magazines daydreaming of what I could make for a baby. In Punto di Venezia by Adele della Porta, 1919 - I found this baby bonnet pattern. There are no written instructions at all! Notice the little picots on all the edges! Wouldn't it be just beautiful all stitched up? Maybe if I start now my friends' grandchildren might be able to wear it! When I first started collecting printed matter on Italian needlework, of course I looked for material in my own mother tongue. 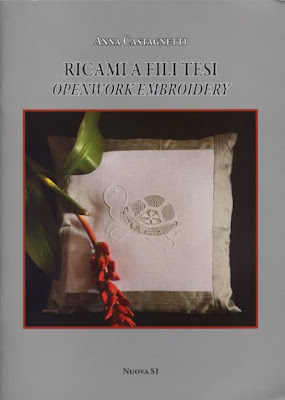 One of the more interesting things I found was Old Italian Patterns for Linen Embroidery by Frieda Lipperheide, (Muster altitalienischer Leinenstickerei in German) translated into English and edited in 1996 by Kathleen Epstein, Curious Works Press. This is an attractive publication. I can't really call it a book because it is more a collection of folios inserted into a cardboard casing tied together with a ribbon. Very much like the 1897 edition of another publication on German needlework by Frieda Lipperheide that I have. Here we are, 14 years after Ms. Epstein's publication and this volume is difficult but not impossible to find. The Scarlet Letter seems to have it in stock. Ms. Epstein's text is translated from an 1892 edition. I find it interesting because it has all kinds of patterns for counted thread embroidery with references to pieces which were either in Ms. Lipperheide's (extensive!) 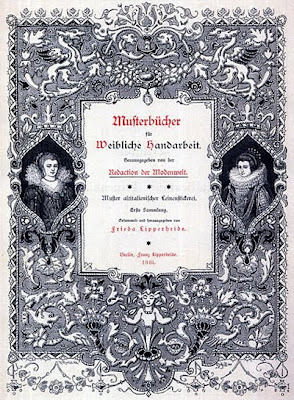 collection of from the collections of museums in Hamburg, Berlin, Dresden and Vienna. Also cited are paintings by Da Vinci, Ghirlandaio, Allori, Raphael, Titian and Bronzino. Ms. Lipperheide believed that Italian embroidery types and patterns descended from Arab influence and many Moroccan stitches and patterns are covered. Her stitch diagrams are good and she often shows the backside. She mentions pattern books by known authors from the 16th century like Mat(t)eo Pagano, Federico Vinciolo and Cesare Vecellio but also one I don't know: Vittorio Serena. There is a good list here of antique pattern books but I don't see him. ... which, since I don't speak any German is interesting for the abundance of pictures and diagrams it has... there seem to be many more than there were in Ms. Epstein's later 1892 edition. 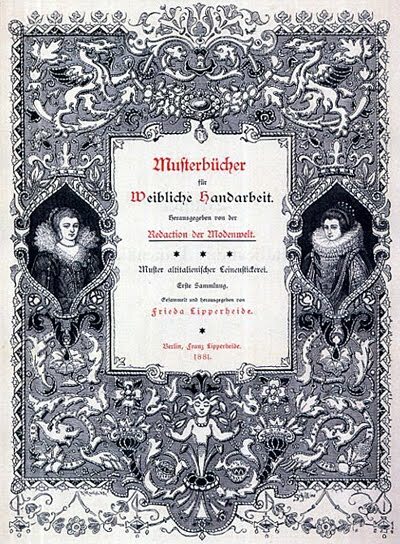 I took a look on the World Catalogue website to see just how many editions of this particular title there were (three - 1881, 1883 and 1892) and was amazed at just how much Ms. Lipperheide had produced. Who was this woman? Someone like me – researching the needlework of Italy from afar? I cannot find anything written about her in English though there seems to have been a book written about her in German in 1999 by Adelheid Rasche called: Frieda Lipperheide 1840-1896: ein Leben für Tetilkunst und Mode [a life of textiles and fashion? I'm guessing here with the help of Google translator.] I'm sorry it hasn't been translated into English or Italian. Can anyone tell me anything about her? P.S. Many antique pattern books can be downloaded from the On-line Digital Archive of Documents.